Incredible growth in essential drugs to mitigate the skin problems and enhance the beauty has extensively supported the growth of cosmeceuticals in past few years. Shampoos and anti-ectoparasites are the two major products of cosmeceuticals that are gaining huge consumer interest mainly in North America and Europe region. Growing popularity of animal friendly products is likely to contribute in the cosmeceuticals market growth during the analysis period. For instance, Novoselect GmbH, a Germany based company launched their products for veterinary industry related with skin healing and germinal lessening. On the other hands, market players are also adopting direct selling of their products in countries to expand their business. For instance, AVON is the largest distributor of color cosmetics in Philippines whereas in countries such as Singapore, direct selling of the product is considered as an entry strategy into the market. As per the Goldstein Research analyst, the global cosmeceuticals market size valued USD 43.57 billion in 2016 and is estimated to reach USD 78.29 billion by 2024 growing at a CAGR of 7.60% during the period 2016-2024. The report covers the present ground scenario and the future growth prospects of the cosmeceuticals market for 2016-2024 along total cosmeceuticals production by volume in every region. We calculated the market size and revenue share on the basis of sales of all product lines of cosmeceuticals with their price value across the globe. We also provide the average spending on cosmeceuticals per person and annual sales figures (USD Billion) of different cosmeceuticals products in major countries. On the basis of product type of cosmeceuticals, skin care occupies colossal share of cosmeceuticals followed by hair care. Over 55% of share was occupied by skin care application segment in 2016. Anti-ageing skin care cosmeceuticals are gaining huge consumer response across the globe. Injectable application is expected to witness the maximum growth during the forecast period owing to the introduction of advance and improved injectable cosmeceuticals. 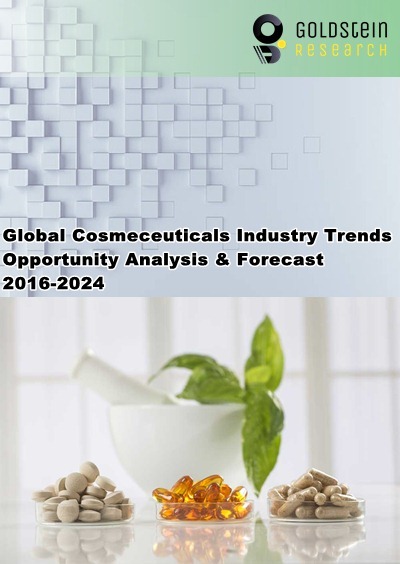 Cosmeceuticals market Outlook 2016-2024, has been prepared based on an in-depth market analysis from industry experts. The report covers the competitive landscape and current position of major players in the global cosmeceuticals market. The report also includes porter’s five force model, SWOT analysis, company profiling, business strategies of market players and their business models. Global cosmeceuticals market report also recognizes value chain analysis to understand the cost differentiation to provide competitive advantage to the existing and new entry players. Our global cosmeceuticals market report comprises of the following companies as the key players in the cosmeceuticals market: Johnson & Johnson, Beiersdorf, L'Oréal, Proctor & Gamble, Shiseido, Unilever and Amway. Other high-flying vendors in the market are: Kao, LVMH, Mary Kay, O Boticário, Revlon, Tom's of Maine, AVON Beauty Products, Burberry, INVERSIONES AVI AMERICA, Chanel, Chatters Canada, Clarins, Combe, Conair, Coty, Edgewell Personal Care, Henkel, Helen of Troy, Bayer, Elementis, Croda International and Estee Lauder. According to the report, growing inclination towards premium cosmetics and personal care products over costly surgeries is one of the major drivers for the growth of cosmeceuticals market. In 2016, over 2 billion populations have spent their money for premium personal care products instead of cosmetic surgeries in Asia-Pacific region. Further, the report states that animals such as rats, rabbits and guinea pigs are used for producing anti-inflammatory, anti-microbial, anti-tumorigenic and other cosmeceuticals. Thus stringent regulations over killing animals for the manufacturing of cosmeceuticals are hindering the cosmeceuticals market growth. Based on geography, North America is the dominating region for global cosmeceuticals market, where the U.S. occupied over 80% share of total North America cosmeceuticals market in 2016. Europe cosmeceuticals market is anticipated to grow at a CAGR of 7.1% during the forecast period. Rising demand for premium personal care cosmeceuticals in countries such as Japan, China, Hong Kong, Singapore, India and Thailand are expected to generate potential opportunities for the expansion of cosmeceuticals business in Asia-Pacific region. What is the total market size by 2024 and what would be the expected growth rate of cosmeceuticals market? What are the developments, innovations and regulations for cosmeceuticals? What is the consumption value of cosmeceuticals in every region and what would be the opportunities over the forecast period? Penetration of e-commerce in sales of cosmeceuticals in major countries? What is the total expenditure on cosmeceuticals in major countries?